Stress is a common aspect of life and can have negative consequences for health. These consequences include direct impacts on mental health and the onset and progression of physical illness1,2. In addition, stress may also influence health indirectly through health behaviours such as smoking, drug use, and excessive eating and alcohol related behaviours3. Canadians who were physically active in their leisure time reported lower levels of stress4. Seniors who perceived low levels of stress were about twice as likely to be in good health as were those with high stress levels5. Working women were more likely than working men to report high levels of perceived life stress6. 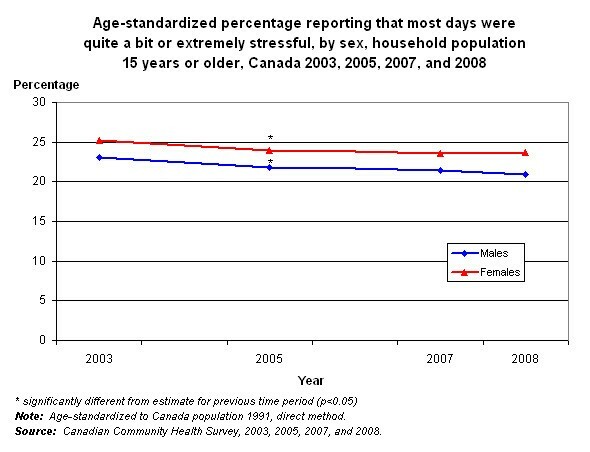 The age-standardized percentage of Canadians who reported that most days were quite a bit or extremely stressful remained relatively stable between 2003 and 2008. Females were consistently more likely than males to report that most days were quite a bit or extremely stressful. In 2008, 21.2% of males (2.8 million) and 23.4% of females (3.2 million) aged 15 or older reported that most days were quite a bit or extremely stressful. Males and females aged 35 to 54 and men aged 25 to 34 years were more likely than Canadians overall to report high levels of stress. These are the ages at which people are most likely to be managing the multiple roles associated with career and family responsibilities. 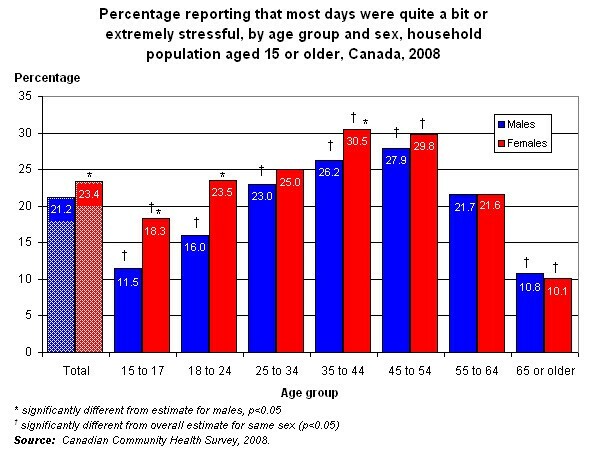 Both male and female seniors were less likely to report daily stress than were Canadians overall. Overall, females were more likely then males to report that most days were quite a bit or extremely stressful, particularly at ages 15 to 24 and 35 to 44. Although relatively few people aged 15 to 24 reported high levels of stress, the difference between the sexes was greatest in this age range; females were 1.5 times more likely than males to report that most days were quite a bit or extremely stressful. Residents of the Newfoundland and Labrador, Prince Edward Island, Nova Scotia, New Brunswick, Manitoba, Saskatchewan and Northwest Territories were significantly less likely than Canadians overall to report that most days were quite a bit or extremely stressful. 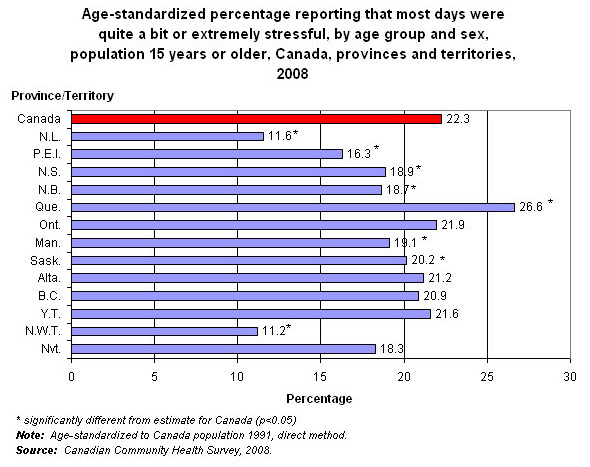 Only Quebec residents reported higher levels of stress than did Canadians overall. 1. Steptoe A. [Invited review.] The links between stress and illness. Journal of Psychosomatic Research 1991; 35(6): 633-44. 2. McEwen BS, Stellar E. Stress and the individual. Mechanisms leading to disease. Archives of Internal Medicine 1993; 153(18):2093-101. 3. Umberson D, Lui H, Reczek C. Stress and health behaviour over the life course. Advances in Life Course Research 2008;13:19-44. 4. Gilmour H. Physically active Canadians. Health Reports (Statistics Canada, Catalogue 82-003) 2007;18(3):45-53. 5. Shields M, Martel L. Health living among seniors. Health Reports (Statistics Canada, Catalogue 82-003) 2006; 16 (supplement):7-20. 6. Shields M. Stress and depression in the employed population. Health Reports (Statistics Canada, Catalogue 82-003) 2006; 17(4): 11-29. Shields M. Long working hours and health. Health Reports (Statistics Canada, Catalogue 82-003) 1999; 11(2): 33-48. Shields M. Shift work and health. Health Reports (Statistics Canada, Catalogue 82-003) 2002; 13(4): 11-33. Shields M. Stress, health and the benefit of social support. Health Reports (Statistics Canada, Catalogue 82-003) 2004; 15(1): 9-38. Statistics Canada. Stress and well-being. Health Reports (Statistics Canada, Catalogue 82-003) 2001; 12(3): 21-32. Wilkins K. Work stress among health care providers. Health Reports (Statistics Canada, Catalogue 82-003) 2007; 18(4): 33-6. Wilkins K, Beaudet MP. Work stress and health. Health Reports (Statistics Canada, Catalogue 82-003) 1998; 10(3): 47-62.